I really don’t know what to say?! Most people related to underwater sports know that it is important to protect the fragile underwater ecosystem and especially the corals. 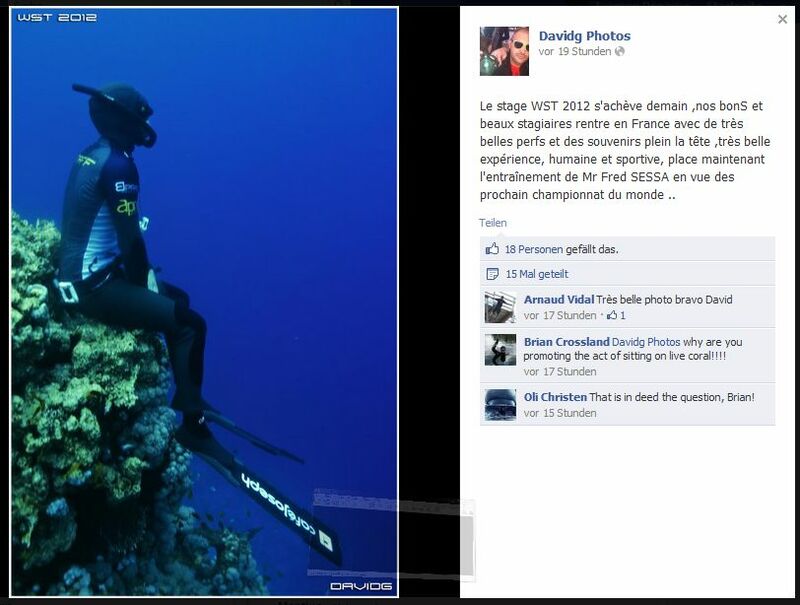 Freediver Fred Sessa or his student has nothing better to do then sitting on coral whilst another ignorant (DavidG) happily publishes this picture. But not enough – french Apnéa Magazine ist also quite happy to publish the picture. So the question is not “idiot or not” but who is the biggest ignorant? the guy sitting on the coral? the guy happily taking pictures? the editor in chief of the magazine that allows publishing it? Well I publish it as well to tell the world about these bunch of disrespectful persons! Share it – and also tell the world about them. They should be banned from being in the ocean! Update: After a storm of protest it seems like the official Facebook page of Fred Sessa has disappeard. The picture was taken down at the pages of DavidG and the Apnéa Magazine – it will remain here as a reminder how not to act as a role model – any apologies from the persons envolved are missing – the Internet does not forget! So is it the fault of the Administrator that somebody was sitting on the coral? I also can’t see where I insulted the family of Fred Sessa. And as I dive instructor I know that it is always the training supervisor who has the responsibility over his students. So could some lawyer from Egypt prosecute the student and/or the the supervisor for deliberately destroying the reef? Mr. Sessa: And I know that every human being makes mistakes and errors. But there is always the possibility to make it right. So instead of bravely pointing at somebody else you also could publish an apology, take responsibility for your team and all of you could donate to a reef conservation organisation. You know what? If you do so – please please let me know and I will happily publish this as well that you did show greatness. How about this?